Nvidia has shown off its new Tegra K1 graphics processor, which packs 192 GPU cores onto a single chip and promises to bring console-class graphics to smartphones and tablets. There was a big emphasis on gaming as Nvidia CEO Jen-Hsun Huang showed off the chip's capabilities during a press event at the start of the International CES trade show in Las Vegas Sunday evening. The Tegra K1 breaks with previous Tegra GPUs in that it's based on the same Kepler architecture that Nvidia uses for its GeForce graphics cards for PCs and that's also used in supercomputers. Having a common architecture for desktop and mobile will allow developers to target a wider audience with their games, and for end users it should mean smoother, more realistic graphics for mobile gaming. Huang announced that Epic Games is porting its widely used Unreal Engine 4 graphics engine to the Tegra K1, which means the newest console games could also be offered on mobile devices. He didn't say which developers will create games for the new chip but that didn't stop him from enthusing over the cinematic experience he said it will provide. Huang demonstrated a mock-up game that was developed to show off the capabilities of Unreal Engine 4 on the Tegra K1 chip. It depicted a dimly lit basement where water tricked down the walls and dim light bounced off a photo-realistic metal bin. The technology employs "global illumination," giving the effect that light is reflecting off all surfaces and not from a single source. It also uses high dynamic range to provide a wider range of contrast in the image. 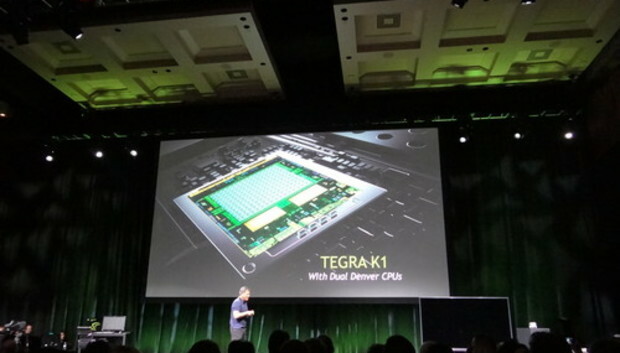 The Tegra K1 will be offered in two versions, one of which will combine the 192 graphics cores with the custom CPU Nvidia has been working on for four years under the codename Project Denver. It was the first time Nvidia had provided any details about the chip, which will be a 64-bit, dual-core part based on the ARMv8 architecture, with the cores running at up to 2.5GHz. Huang said little else about Denver on Sunday except that he was relieved to see it working. He gave a brief demonstration that involved flicking through the menu on an Android tablet. The other version of the Tegra K1 combines the GPU cores with a 32-bit, quad-core CPU based on the ARM Cortex-A15 design, running at up to 2.3GHz. The quad-core Tegra K1 will appear in devices in the first half of this year, Nvidia said in a press release, while the version with Denver will appear in the second half. Nvidia hopes the Tegra K1 will be used for more than just gaming. It's launched a project to develop automotive design programs that car showrooms will be able to use to let customers select a color scheme for their car and see what it will look like in photo-realistic, 3D images. And it wants the K1 used inside cars as well, to support anti-collision systems and to power digital dashboards that display life-like dials and controls.